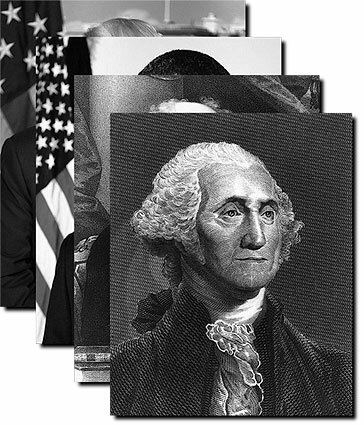 This is a complete set of the 45 official U.S. President portraits as Black and White photo prints. Scroll down to see all 45 presidential portraits that are included in this set. Earlier era presidents didn't necessarily have "official" portraits, and many later presidents have more than one "official" portrait. This set was curated and restored by us for display at the 2008 Democratic National Convention (President Obama was added later). It has since been used repeatedly by both Democratic and Republican national, state and local organizations. The clarity and detail in this set, combined with being real continuous tone silver halide photos, makes these probably the nicest set of U.S. President photos available anywhere! - Order by 8am EST Mon. - Fri., select 1, 2 or 3 Day Shipping in Checkout, and we will rush process and ship this photo set the same day. - Order by 8am EST Mon. - Fri., select Standard, Economy, or any International Shipping in Checkout, and we will ship in 2 business days.